Ever since the movie "Pirates of the Caribbean" was released rum has become our favorite alcohol. Ok, we don't discriminate on any alcohol (except for you Mr. Wine Cooler! ), but rum is really freaking good. We have always associated rum with tropical islands and what we didn't know is that you can find an exceptional rum in Laos. Rum is made from sugar cane, and Laos is covered with sugar cane fields, which makes this country a perfect environment for rum production. On our recent trip to Luang Prabang, the UNESCO heritage village, we tried LAODI, a rum made in Laos by a Japanese man. 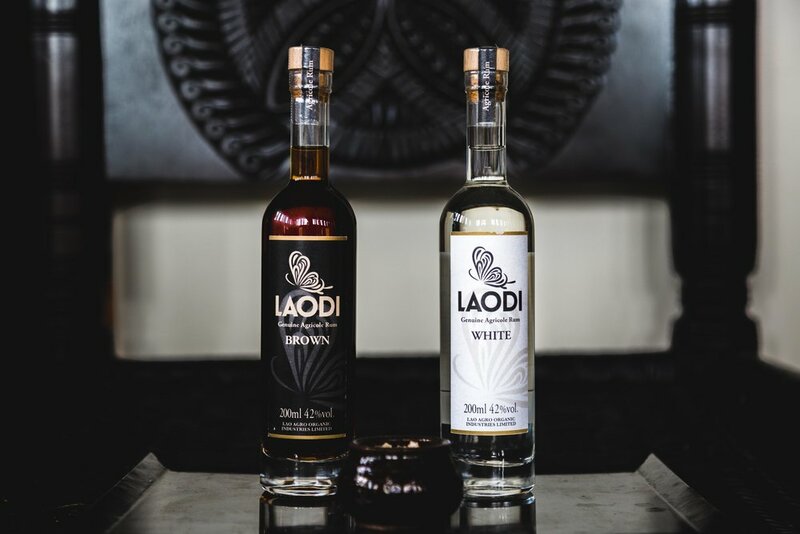 According to their website, what makes LAODI rum special is the fresh water from the Mekong river, which irrigates the land where their sugar cane grows. Only 3% of rum production comes from pure sugar cane, which makes LAODI a very small distillery with a unique taste. They also claim that because unlike other commercial rum, which is made with molasses, their rum won't give you a nasty hangover, which we have, um... thoroughly tested and can confirm is true. We first learned of LAODI rum at the Luang Prabang night market, where you can have a free tasting. The sales lady kept pouring generous shots of every rum and we left buying two of their classic bottles of rum: BROWN and WHITE. Our favorite, however was their COCONUT flavored rum. It is tasty just to sip on and you can imagine that it would the best liquor to add to any "beach/summer" inspired cocktail with pineapple or milk. Other flavors of infused rum include: passionfruit, sugarcane, coffee and plum. Although Laos is a very beautiful, laid back country with a unique culture and some of the best foods we have tasted, if that doesn't get you excited, just know that LAODI rum is reason enough to visit.